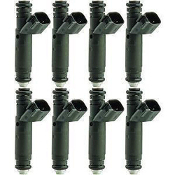 These injectors flow 60 lbs/hr at 43.5 PSI ( 3 BAR ) and up to 85 lbs/hr at 87 PSI! In addition, these units are high-impedance. Despite the high flow rate, they are linear and controllable at low pulse widths and have been used in ULEV applications! This allows you to use a larger injector than normally possible without hurting idle and low speed driveability. Adding to the flexibility of application, these units are high-impedance; making them compatible with most ECUs, while delivering the most flow available in a High-Impedance injector. Engine performance and running quality are enhanced through the optimized spray pattern. Unlike competitors “pencil stream” high flow injectors; these High Flow injectors utilize a multi-orifice tip providing a true 30 degree spray pattern for improved mixture preparation. This results in lower BSFC and better idle quality than many injectors with less flow.